I‘m at it again, and it’s one of those things that reef keepers hate the most; I’m preparing to move a large reef tank’s inhabitants from one state to another. In this case from Cape Cod Massachusetts, to Portland Maine. The last time I moved my animals was in 1998, then from NYC to Cape Cod. As most of you know, my animals currently are in a 10-foot glass tank, and have grown quite large. In fact, some of the coral heads will have to be broken to get them out of the old tank. 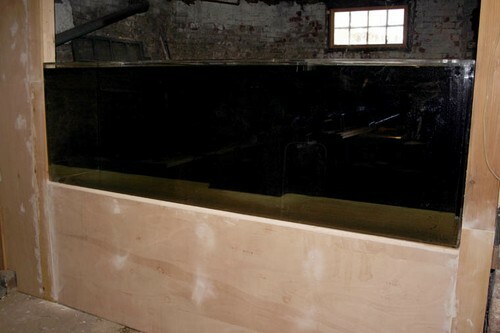 The new tank will only be 8-feet long, but is higher and longer, and made out of acrylic. It was in fact the largest tank I could get down the stairs into the basement, and again I will use a 300-gallon Rubbermaid fiberglass, livestock feeding trough for the sump. The final volume of water will be the same — around 800-gallons. I briefly contemplated giving all of the animals away and starting from scratch, but realized almost immediately that I couldn’t. Many of the corals and fish have been with me for better than 20-years, and my Amphiprion frenatus for almost 24-years. As the saying goes, ‘we are family.’ So, I find myself confronted with a number of husbandry issues, and thought I ask our readers for some feedback. First, however, the new tank. The tank was the largest I could get down the cellar stairs, and even then I had to cut away some ceiling and modify the stairway — what we do for our animals. A glass tank would have been my first choice, but I could not find anyone to build a large glass tank on location, and a premade glass tank of this size would be impossible to move. My concern about the acrylic tank — made beautifully by Precision Acrylics — is how to keep from scratching it when removing the inevitable coralline algae, which as we all know loves to grow on plastic. I’m very open to advice from those of you with experience with acrylic tanks. I already know to be very careful. The new tank is located in the basement, where I’m in the process of building a wall around it; behind it will be the 300-gallon sump and associated equipment. A more complicated and controversial question is substrate. First, either to use a simple dusting on the bottom of the tank just for appearances, or what is the generally approved method of using a fine sand bed of 2 to 6-inches deep with a plenum. Whether a fine sand bed and plenum actually helps to reduce acuminating nitrates is a matter of some controversy. See Rob Toonen’s features regarding this. Also, there appears to be some anecdotal evidence that over a period of several years deep sand beds may contribute to what has been called the “old tank syndrome.” What do you think? Incidentally, in then near future we will publish a feature by Julian Sprung on this subject. And, also incidentally, Sprung’s and Delbeek’s volume 3 of their much lauded The Reef Aquarium series is now available. Many of us have been waiting for this publishing event. I have already thumbed through the new addition, and it is well worth the money.